A map showing the geographical extent of the Marksville cultural period. The Marksville culture was an archaeological culture in the lower Lower Mississippi valley, Yazoo valley, and Tensas valley areas of Louisiana, Mississippi, Missouri, Arkansas and extended eastward along the Gulf Coast to the Mobile Bay area, from 100 BCE to 400 CE. This culture takes its name from the Marksville Prehistoric Indian Site in Avoyelles Parish, Louisiana. 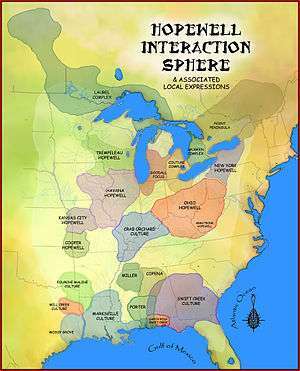 Marksville Culture was contemporaneous with the Hopewell cultures of Ohio and Illinois. It evolved from the earlier Tchefuncte culture and into the Baytown and Troyville cultures and later the Coles Creek and Plum Bayou cultures. It is considered ancestral to the Natchez and Taensa Peoples. The Hopewell tradition was a widely dispersed set of related populations, which were connected by a common network of trade routes, known as the Hopewell Exchange System. The Marksville culture was a southern manifestation of this network. Settlements were large and usually located on terraces of major streams. Evidence from excavations of burial mounds from this period suggest they were constructed for persons of high social status, and contained grave goods of imported exotic materials such as copper panpipes, earspools, bracelets and beads, rare minerals, stone platform pipes, mica figurines, marine shells, freshwater pearls, and greenstone celts. The pipes had flat bases with a hole for a stem, and a bowl in the center. Animal figurines on the platform aren't unusual, with the bowl being located in the animal's back. The high status leaders organized community life, and officiated at burial ceremonies, an important part of the Marksville Culture. The mounds were constructed in stages over many years, with the first stage being a flat, low platform. The ceremonies may have been held years apart and those who died between ceremonies were temporarily stored in other locations, then gathered up and buried together. Although made from local clay, Marksville pottery was similar in design and decoration to pottery found in Illinois and Ohio. A typical vessel was three to five inches tall and three to seven inches in diameter and often decorated with geometric and effigy designs, usually stylized birds. This decorated pottery was made primarily for ceremonial uses, with other plainer utilitarian ware for daily use. Marksville pottery influenced Santa Rosa pottery, a defining character of the contemporary Santa Rosa-Swift Creek culture, located to the east of the Marksville culture area along the Gulf coast. 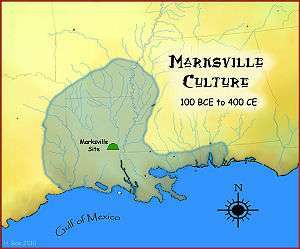 The Marksville culture was preceded by the Tchefuncte culture, and was eventually succeeded by the Troyville culture in southeastern and eastern Louisiana and western Mississippi and Baytown culture in northeastern Louisiana, northwestern Mississippi,and southeastern Arkansas. 1 2 "Louisiana Prehistory-Marksville, Troyville-Coles Creek, and Caddo". Retrieved 2010-02-04. 1 2 3 "Kisatchie National Forest". Retrieved 2010-02-04. ↑ "Southeastern Prehistory : Late Woodland Period". NPS.GOV. Retrieved 2011-10-23. ↑ "The Plaquemine Culture, A.D 1000". Retrieved 2008-09-08. ↑ Douglas T. Price, and Gary M. Feinman (2008). Images of the Past, 5th edition. New York: McGraw-Hill. pp. 274–277. ISBN 978-0-07-340520-9. ↑ "Southeastern Prehistory-Middle Woodland Period". Retrieved 2010-02-04. ↑ Milanich, Jerald T. (1994). Archaeology of Precolumbian Florida. Gainesville, Florida: University Press of Florida. p. 151. ISBN 0-8130-1273-2. Wikimedia Commons has media related to Marksville culture.